MIAMI, Dec. 14, 2015 (GLOBE NEWSWIRE) -- The Miami International Map Fair, the longest continuously running map fair in the world, will return to HistoryMiami Museum February 5-7, 2016. Over 40 leading map dealers will gather from across the globe bringing an unparalleled selection of original antique maps, charts, town plans, and atlases. Thousands of maps from the 16th century to present day, and ranging in price from $25 to over a $100,000, will be on display offering something for the first time buyer, as well as the seasoned collector. 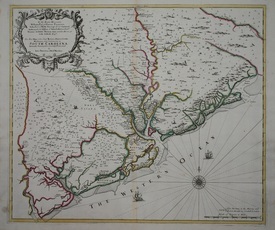 One of the rarest maps on display will be the first printed map of South Carolina, and the first to designate it as so. The map, drawn in 1695 and priced at $95,000, focuses on the developed region around Charleston, reaching southwards to the South Edisto River and north to "Sewee Harbor". Also for sale will be a superb, scarce and important map of the Eastern Seaboard from Cape Lookout to Florida, with Cuba and the Bahamas, published by Theodore de Bry in 1591. 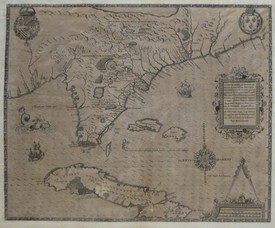 The map was drawn by the French artist Jacques Le Moyne de Morgues, who'd accompanied French explorer René de Laudonnière to Florida in 1564. "Maps are about history and HistoryMiami is proud to host one of the biggest events of its kind in the world, highlighting an ever-growing appreciation for international and rare maps," Stuart Chase said, President/Chief Executive Officer for HistoryMiami Museum. "Each year, the Map Fair showcases rare maps that give a fascinating insight into the past and gives collectors and map enthusiasts the opportunity to come together and peruse visual pieces of living history." Held annually during the first weekend in February, the Miami International Map Fair provides buyers with a weekend to browse antique maps, rare books, panoramas and atlases from around the world, as well attend a series of special topical lectures. This is a unique opportunity to meet experts with an unrivalved depth of knowledge and scope of material. Additionally, The Florida International University GIS Center has partnered with the Miami International Map Fair and will present interactive GIS presentations throughout the weekend that will show the growth of Miami over the decades through aerial photographs. Daily admission to the Map Fair is $20 for adults and children, $15 for HistoryMiami members and $10 for students with ID. Full access weekend registration is $70 per person for HistoryMiami members and $80 for non-members and includes a VIP Private Preview on Friday evening before the fair opens to the public, a cocktail reception with the map dealers, and complimentary lunch on Saturday and Sunday. A Friday night cocktail reception and dinner is available for $75 per person, in addition to the registration fee, and is open to full access weekend registrants only. Online Weekend Registration is open until February 3, 2016. Fair hours are Saturday, 10 a.m. to 5 p.m. and Sunday 12 to 5 p.m. at 101 West Flagler Street in downtown Miami. Parking is available at the Cultural Center Parking Garage, 50 NW 2 Avenue. The Miami International Map Fair sponsors include Miami-Dade County and BrandsMart U.S.A. Sponsorship and underwriting opportunities are still available, please contact 305-375-1618 or email [email protected] for more information. To register for the Miami International Map Fair or event information, please call 305-375-1618 or email [email protected]. For high-resolution map images and credit information, please email Michele Reese at [email protected]. HistoryMiami Museum, a Smithsonian Institution affiliate, is the premier cultural institution committed to gathering, organizing, preserving and celebrating Miami's history as the unique crossroads of the Americas. We accomplish this through exhibitions, city tours, education, research, collections and publications. Visit www.historymiami.org to learn more.